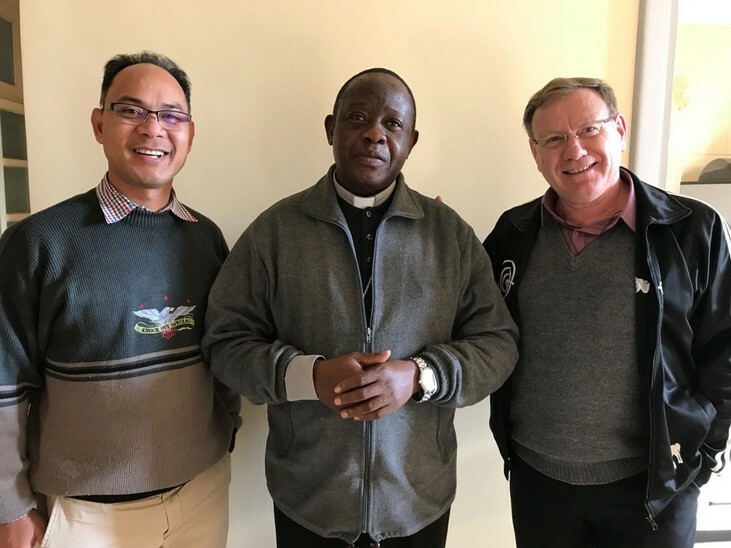 ROME - On 6th December 2017, as Father Luizinho celebrates his 32th anniversary of priesthood, we were honoured by the visit of Monseigneur Dieudonné Madrapile, Bishop of Isangi (DRC). He came to Rome for the cause of canonization of Blessed Clementine Anuarite Nengapeta, a Congolese nun of the Sisters of the Holy Family. She was born in 1939 and she was murdered in 1964 during the rebellion. She was beatified on August 15, 1985 at Kinshasa by Saint John Paul II. The Diocese of Isangi receives the Montfortian Family to work. The visit of the bishop was a visit of friendship. Thank you Monsignor for your visit. P.Luizinho, felicitaciones aunque tarde peor es nunca. Feliz navidad, anõ nuevo y tus 32 años de sacerdote, como misionero monfortiano en el perú-Brasil y el mundo. Mis oraciones para que sigas fiel en tu sacerdocio y en tu servicio como coordinador general de los monfortianos en el mundo. Abraços. P.Alejandro.